Calculating your head size accurately is the key to a long and happy relationship with your legal wig. Make sure your hair is flat, not bunched up - if it is tied back in a ponytail, braided or in a bun it may interfere with your head measurement. Place the end of the measuring tape in the centre of your forehead. Wrap the tape gently but snugly around your head. Keep it just above your ears, and make sure it goes around the largest part of the back of your head. Pinch the parts of the tape which overlap on your forehead, and pull it away from your head so that you can look at it. 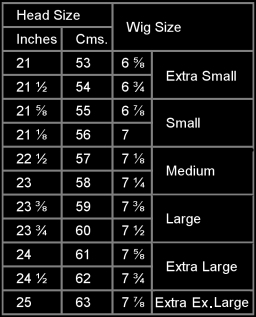 Using the chart convert the inches or centimetres into your wig size. Keep in mind that your wig will fit with the same snugness as the tape, so make sure the tape is neither too tight nor too loose as you measure your head. For best results measure 2 or 3 times to be accurate. Please Note: We primarily stock Sizes 56 to 61, however, we are happy to have smaller or larger sizes specially made. For our clients we have made bespoke wigs ranging between Sizes 55 and 65. For such one-off wigs the time for delivery will increase by around four weeks although the price will remain the same.